Those were the words spoken to me in the confessional on Divine Mercy Sunday, inRome, on the first Sunday after Easter Sunday, after the Canonization of Saint Maria Faustina Kowalska of the Blessed Sacrament, on April 30, 2000. The words that this priest spoke to me in the confessional touched my heart so profoundly, It gave me a most precious image of God’s awesome love and mercy for me, a sinner and for each human being. In today’s ‘Culture of Death’ (e.g. Abortion, euthanasia, homosexuality, etc) this message of how precious each person is in God’s eyes needs to be shouted from the rooftops! We need to ‘strive for Heaven’ now! It is important at this point to stress that God sends no one to Hell. They choose to go to Hell of their own free will by refusing God’s countless offers of His mercy towards them. Thus when they refuse God’s Mercy they have to face His Justice, as he explained to Saint Faustina. You will discover as you read about God’s message of Mercy to Saint Faustina, how God wants everyone to be saved, to spend Eternity with Him in Heaven. However He has given each one of us the gift of “free will” to determine our own destiny…”Heaven or Hell”. So I plead with you, read on and check out the various websites on Divine Mercy which are listed below. Strive for Heaven NOW! Tomorrow could be too late! 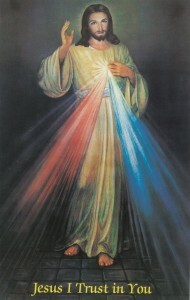 The following are excellent websites to inform yourself about “Divine Mercy” as revealed by Jesus to Saint Maria Faustina of the Most Blessed Sacrament.